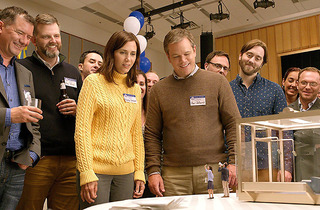 Matt Damon and Kristin Wiig co-star in a stature-challenged future-shock comedy that reduces Alexander Payne's bite to a pinch. “I am big—it’s the pictures that got small,” Hollywood’s Norma Desmond spits out in Sunset Boulevard. Now, Sideways and Nebraska director Alexander Payne (working with his longtime cowriter Jim Taylor) has found a way to make both the stars and the pictures small. 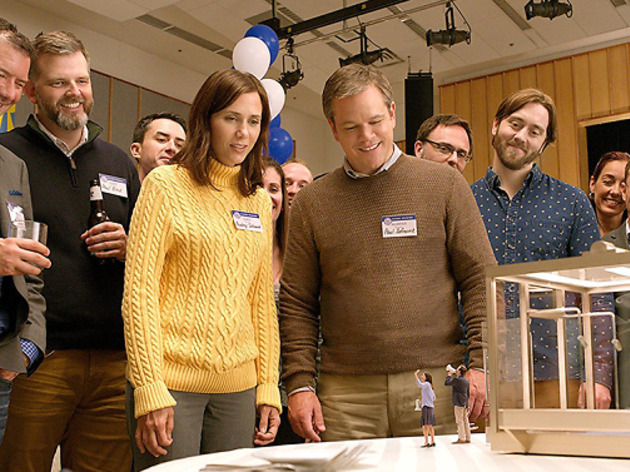 Downsizing is a self-satisfied sci-fi nothingburger that shies away from its early suggestiveness and goes as deep as your average Black Mirror episode. Worse, it saps this usually formidable writing duo of its penchant for tartness. Miniaturization—shrinking yourself down to enjoy a dawning new economy for the “community of the small”—may be the way of the future in an equity-poor world, in which one can finally afford a McMansion or diamond earrings provided they’re roughly two-thousandths of the typical size. But the vicious satire you have in your head about diorama-dwelling haves versus huge have-nots never materializes. Downsizing your expectations will help. As medium-grade satire (hardly another The Truman Show), Downsizing works fine enough. But it makes a series of wrong moves that throw off the delicate tone, raising the pretension levels to toxic. Two Eurotrashy neighbors (Christoph Waltz and Udo Kier, the latter playing a former yachtsman who purrs over his new toy boat) blur Payne’s critique on social climbing; they’re way too gaudy. Later, the introduction of a cringeworthy Vietnamese cleaning woman and ex-dissident (Inherent Vice’s Hong Chau) borders on broken-English caricature. The movie wants to get at bigger ideas about human extinction and the sustainability of “perfect” communities, but it forgets the simplest thing, which is to show how the outside world would interact with these tiny jerks. Where’s the wider perspective? Lost up its own minuscule navel, Downsizing is a film that gets around to a toothless variation on “size doesn’t matter,” but Payne ought to know that's the most boring idea imaginable, big or small. This was an interesting movie - thought it was going to be like a comedy like Innerspace but this turned out to cover quite a few serious topics like the environment, the end of the world, immigration, poverty etc. It was interesting to see prejudices form between big and little people. It was fascinating to see how the movie addressed the shrinking process e.g. filling removal prior the zapping. It was very entertaining. I didn't expect it to explore its version of such serious topics. Saw this movie yesterday - Kristen Wiig is hardly in it, I wouldn't say that she co-stars but she was definitely a big reason I went to see it. I liked the premise and there were some weird humor throughout that made the movie feel light despite its "the end of the world is now" message. There were a lot of little plot lines that were really interesting. Overall good movie.